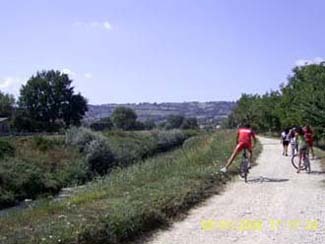 "Il Borghetto" enjoys of an ideal position for a lot of excursions on the region. 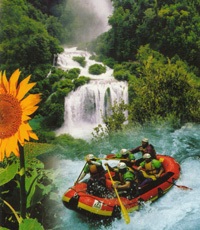 Excursions that can satisfy any requirements: historicocultural, naturalistic, entertaining, sports (from the most relaxing such as fishing, to the most exciting such as rafting). Indoor bathrooms in each room. 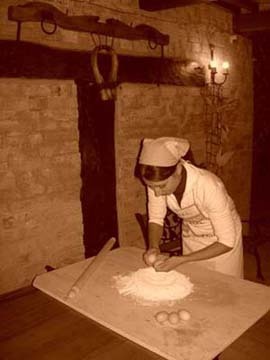 Cultural activities on the farm:At Il Borghetto we organize cooking course of typical Umbrian cuisine, letting you discover a lot of secrets of our local genuine recipes, making only use of natural products. Besides you can have information about the particular methods used to make the famous "Sagrantino" wine DOCG, from the harvest of the grapes to the tasting. The guests can take part in the grape picking, in the olive picking; they can actually learn how the animals on the farm are fed and how a vegetable garden is cultivated, with the opportunity to taste fruit and vegetables just picked. Sport and entertaining activities on the farm: The guest can walk or ride mountain bike, play bowls or tennis table, use the barbecue, the fireplace and the wood oven, delighting in the hall with board games and so on. Cultural activities in the surrounding: "Il Borghetto" is on an advantaged position, to visit the most beautiful resorts, in Umbria, rich in history and culture, such as Montefalco (4 km), Trevi (8 km), Bevagna (km 10), Foligno (15 km), Spello (20 km), Assisi (25 km), Perugia (40 km), Campello sul Clitunno (6 km), Spoleto (15 km), Todi (30 km), Gubbio (45 km), Orvieto (50 km), Norcia (45 km), Cascia (35 km), Cascata delle Marmore (35 km), Grotte di Frasassi (70 km). These towns and their hamlets periodically organize historic-medieval commemorations, feasts and village festivals where you can taste the typical local flavours, and enjoy yourselves with semplicity among the natives who go wild in dancing and folk games.We organize guided visits to wine cellars where the famous Sagrantino di Montefalco DOCG is produced, and to oil mills in order to find out all the secrets on the fine extra virgin olive oil. Sports and entertaining activities: Very near our farm there are several opportunities of fun for young and less young people: tennis fields, five-a-side football fields, bowling alleys, rafting, go-kart tracks, winter and summer swimming-pools, gyms horseriding centres, bingo halls, multiplex, sports fishing, discos, dance halls, pubs.